This diminutive tool from Soto turns your disposable lighter into a tiny torch capable of flame temperatures up to 2300 degrees Fahrenheit. Light stoves and lamps, solder metal, and melt snow with this long-lasting, wind-resistant flame. Looking for the perfect way to combine your love of Mexican wrestling and getting drunk? Well, the former probably goes hand-in-hand with the latter, but if you can’t make it out to the ring, these masked Luchador bottle openers will spar with your favorite drink. Operating the BUG-A-SALT is simple. You fill the reservoir with table salt (you know, the stuff in the cardboard tube with the little metal spout that flips up? ), you give it a single pump, flip the safety, and you’re armed and ready to blast flies into oblivion. At the peak of your celebration when two hands come together for an epic moment of high five bliss, you can’t afford not to have confetti blast high into the air and rain down around your triumphant gesture! 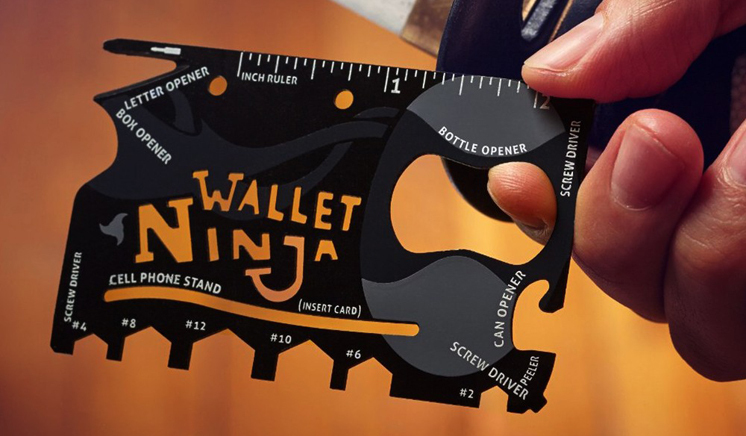 It’s the same size and shape as your average credit card, but the Wallet Ninja ensures that you’re ready for just about anything that comes your way. It has 18 tools that help you open beers, fix your eyeglasses, tighten bolts, open boxes, and even stand your cell phone up. The one socket fits fasteners of almost any shape – square, hex, wing nuts, cup hooks, eye screws and even broken, stripped and rusted nuts other wrenches can’t move. The NEMO Helio LX Pressure Shower is portable and delivers 5 to 10 minutes of steady water pressure. The Helio provides refreshing showers at camp, rinses off gear or even washes the dog. Unlike conventional gravity-fed, hanging shower systems, the Helio system uses a 22 liter welded fabric water tank pressurized by a foot pump. The Hamilton Beach Breakfast Sandwich Maker wants you to skip the drive thru, and create your own masterpiece from the comfort of your home. Use all of your own, fresh ingredients including eggs, cheese and any precooked meats you’d like.